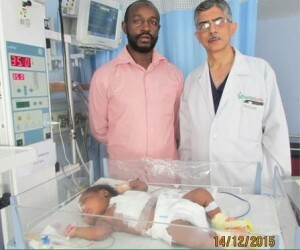 A team of paediatric cardiac surgeons doctors, performed a complex 7-hour long open heart surgery on a month-old baby from Nairobi, Kenya, suffering from three major cardiac ailments – Transposition of Great Arteries (TGA), Ventricular Septal Defect (VSD) and Patent Ductus Arteriosus (PDA). Transposition of Great Arteries is a condition where the lung and heart arteries are switched at birth. The lung artery (Pulmonary Artery) is attached to the left side of the heart and the body artery (Aorta) is attached to the right, creating a potentially fatal situation. VSD is a condition where the septum between the two ventricles is incomplete, causing shunting of blood between both the ventricles. PDA, a passage remains open between the aorta and the pulmonary artery (which normally closes automatically after birth). This, in turn, leads to mixing of deoxygenated and oxygenated blood.